When myth becomes reality, reality becomes a nightmare. Like any other teenager in America, Ashley just wants a normal life. But growing up in an orphanage for the insane is anything but normal. After endless therapy and increasing medication, her nightmares have only gotten worse. Probably because they’re not nightmares. When Ashley’s mysteriously abducted, she finds a reality even less normal than the orphanage. And she discovers something else—she’s no ordinary orphan. Faced with enemies thought to only exist in fairy tales, Ashley discovers she possesses a powerful Maya bloodline. 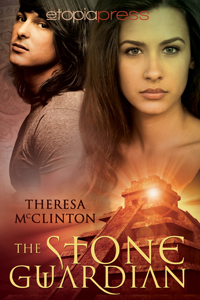 She’s the daughter of an ancient Maya Guardian, whose duty is to protect the Stone of Muuk’ich, an enchanted relic blessed by the gods. But first she must get it back from Sarian, a power-hungry demigod who slaughtered the last guardian—Ashley’s mother. Without the stone, all will be lost. A long time enthusiast of things that go bump in the night, Theresa started her writing career as a journalism intern—possibly the least creative writing field out there. After her first semester at a local newspaper, she washed her hands of press releases and features articles to delve into the whimsical world of young adult paranormal romance. Since then, Theresa has gotten married, had three terrific kids, moved to central Ohio, and was repeatedly guilt tripped into adopting a menagerie of animals that are now members of the family. But don’t be fooled by her domesticated appearance. Her greatest love is travel. Having stepped foot on the soil of over a dozen countries, traveled to sixteen U.S. states—including an extended seven-year stay in Kodiak, Alaska—she is anything but settled down. But wherever life brings her, she will continue to weave tales of adventure and love with the hope her stories will bring joy and inspiration to her readers. Sounds fantastic! Thanks so much for sharing! Thank you for stopping in, Erin!